Why and when did you decide you wanted to write? I always wanted to write. I cannot remember a time when I did not write. I was one of these odd kids who had trouble expressing themselves verbally but when I put pen to paper the words just flowed. I wrote my first book at six years old. I was an animal fanatic and use to write about birds and nature and staple the pages together. I wrote my first fiction book at 8 years old called Lucille and Teddy's Great Adventure for a girl I "mentored" in primary school called Lucille. I still have a copy today! I always declared as a child that when I grew up I'd be a writer. I have written stories and poems for as long as I can remember. At 17 I started writing and performing poetry and rapping. It was a huge outlet for me as a teenager going through a range of conflicting emotions. I've always found writing cathartic. I don't think there was any point that I decided to do it; it just happened. Is there any special practice that you perform during or before you start writing? No. Writing Mr Wrong was a funny one. The words would come at the oddest of times; walking home, 3.00.am in the morning or late at night. It was almost as if I had to type at the speed of lightning to catch up with the words in my mind. I read Julia Cameron's Book The Art of Writing and there are so many great exercises in there. One good one for inspiration is the Stream of Consciousness exercise. Every morning she advises you to write a stream of consciousness to get your thoughts going. I haven’t done this for years but it’s a great exercise and I do it with the students I teach, especially ones who are unconfident and don’t know where to start. I always tell them they can write the seven colours of the rainbow or vent about their frustrations; anything just to get the mind going and thoughts activated. Hmmm..perhaps I need to start doing this again. Mr Wrong is your first book. What inspired you to write this book? I was inspired by understanding the power of sharing our stories and experiences with others. I was inspired by the fact that I had a decade of dating disasters under my belt and wanted to claim this to empower others. I had so many friends in their 30s; wonderful women who are beautiful, intelligent, supportive, have great jobs, women who were kind, vivacious, giving and loving who all seemed to be attracting the same sort of Mr Wrong, or to be clear, men who were “unavailable.” These were men who had multiple names, multiple girlfriends, past baggage or men who just had no intention of committing. You know, the typical Mr Dreamers who come in with hearts and flowers, sweep you off your feet and disappear after the three month marker. I wanted to unite women by weaving ours stories together, inspire women by allowing them to identify patterns in their own relationship history and empower women by providing exercises, quizzes, reflections and advice through success stories that allows them to question, challenge their own negative belief systems they may have about Love, Relationships and most importantly themselves. Mr Wrong is certainly not a blame book or man bashing book, but an opportunity to journey within and examine why it is we are attracting these situations and men. When we keep on attracting the same circumstances, situations and people we have to look within and Mr Wong gives women the opportunity to do that. What would you say to women who are experiencing some of the challenges you describe in your book? Firstly, take time to know yourself. Really know yourself, your strengths, your weaknesses, flaws, ambitions and passions and love every bit about YOU. Identify and affirm what your values are. The clearer we are on our needs, wants and desires, and this transcends beyond relationships, the more likely we will to reflect this into our loves. When we are not clear on what is important to us essentially we can allow for anything to wonder into our energy. When we are clear on our boundaries and values we begin a process into establishing and knowing our worth and, as Nathan says in his story, there is nothing more attractive than a person who knows their own worth and value. Don’t wait for anyone to validate you and tell you your worth. Validation comes from within. Can men find the book helpful too? Strangely, enough, I’ve had a lot of my male friends call me up and say things like, “I think I’m a Mr Dreamer y’know” or “I identified with so much of this character or such and such story.” I think it opens up a doorway to what women really experience in relationships and the emotional effects. In saying this it also has candid stories from men relaying their heartbreak and this too, gives space for men to identify with emotions that other men have experienced. It became evident through my interviews with the men that they just do not talk about emotions or relationships as much which can create a sense of bottled up emotion that can be detrimental to their next relationship with a woman. Men who have been hurt or treated badly by women often form walls and protect themselves from being hurt by becoming emotionally unavailable and thus the cycle continues. I think Life would be so much better if we were all kinder to each other! What were some of the challenges writing Mr Wrong? Getting everyone to send in their permission slips in on time! Time was hard as I was teaching full time, working 3 jobs 6 days a week...but if you are passionate enough about something…. You followed Mr Wrong up with a poetry anthology 7 Shades of Love. What made you do this? 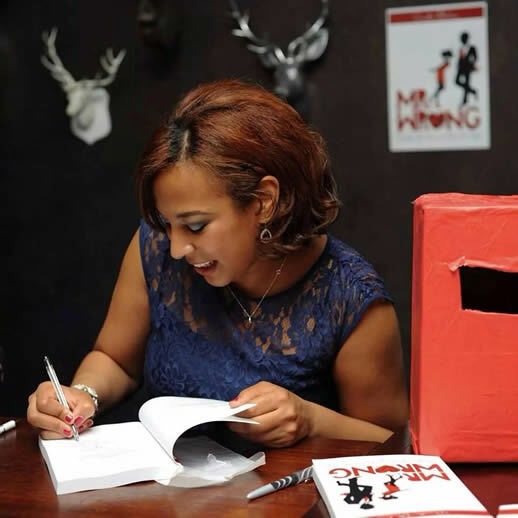 When I first started my journey creating Mr Wrong, I appealed for stories and poems. As Mr Wrong began to take shape, I realised that I needed another platform for the poems so decided to create 7 Shades of Love. I am a huge lover of poetry and have written poetry as long as I can remember so really wanted to include this medium too. More importantly, I had so many amazing poems submitted I just had to utilise them! 7 Shades of Love is a quest to exploring the different types of Love that exist. It explores Love through colour and their Western and Eastern associated meanings. 7 Shades of Love explores a more spiritual aspect of Love through making connections between the 7 vital chakras, their colours and relations to spiritual growth and Love. Where can copies of the book be purchased? You can buy a SIGNED copy of Mr Wrong directly from my website at www.daniellablechner.com or Amazon and most online distributors. Where and when is your next book signing event? signed copy of both books and win prizes.